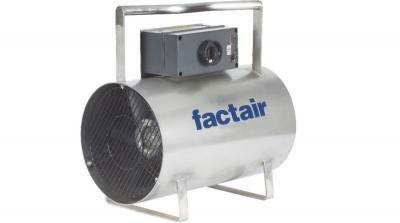 Factair's Ventsafe range comprises a selection of fans and ancillary equipment for effective ventilation of confined spaces. Compressed air or 300mm 110V electrically powered fans are available including intrinsically safe ATEX options. Each fan has a robust construction and both the 110V electric and Atex versions incorporate an innovative curved carrying handle to allow 2-people to transport the fan. The range is augmented by layflat and wire reinforced anti-static ducting, which is supplied complete with windlass coupling to allows lengths to be joined together.